Aquaculturally important sea-bass species belong to the families Serranidae and Centropomidae. Aquaculturally important sea-bass species belong to the families Serranidae and Centropomidae. The European sea-bass common in the Mediterranean and in eastern Atlantic is Dicentrarchus labrax. The Asian sea-bass, also knownas kakap (cockup) and giant perch, is Lates calcarifer (family Centropomidae), distributed inthe littoral waters from Iran to Australia. The two major species cultured are the gilt-head sea-bream (Sparus aurata) in the Mediter-ranean countries and the silver sea-bream (Pagrus aurata) in the Far East, but there are several other species of sea-breams, which are gaining aquacultural importance. Global farmed production of gilthead sea-bream has been reported as 86160 tons in 2000, and the lead producer country was Greece (FAO, 2002). The corresponding silver sea-bream production was 82811 tons, with the major share of production being from Japan. The other species of sea-breams which are entering the arena are blackhead sea-bream (Acantopagrus schlegeli) (the major producer country being Taiwan), sharp-snout sea-bream (Diplodus puntazzo) (mainly in Italy), white sea-bream (Diplodussargus) (Greece), two-breasted sea-bream(Diplodus vulgaris) (Turkey), goldsilk sea-bream (Acanthopagrus berda) (Kuwait), cobalty sea-beam (Sparus hasta) (Kuwait), goldlined sea-bream (Rhabdosargus sarba) (Hong Kong), white sea-bream (Diplodussargus) (Greece), yellowfin sea-bream(Acanthopagrus latus) (Bahrain), yellowback sea-bream (Dentex tumifrons) (Taiwan), common dentex (Dentex dentex) (Spain), common pandora (Pagellus erythrinus) (Greece), red porgy (Pagrus pagrus) (Greece) and crimson sea-bream (Evynnis japonica) (Japan). Common to all sea-basses and sea-breams are their euryhaline and carnivorous habits. They fetch high prices in the markets. Landings from capture fisheries are reported to be declining and there is an increasing and unsatisfied market in major consuming areas. Consequently, aquaculture-produced sea-basses and sea-breams have the potential for enhancing both domestic and export trade. 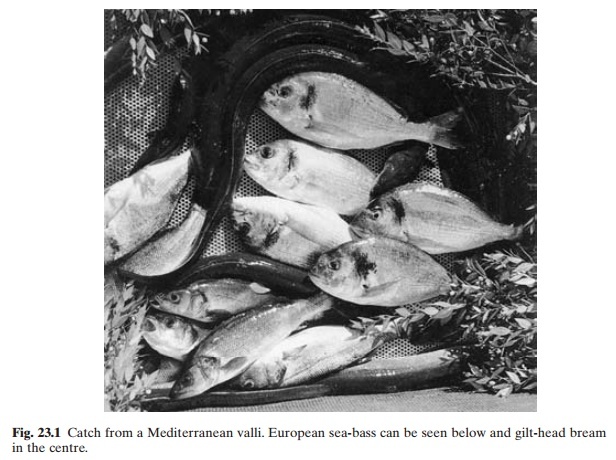 Historically, the European and Asian species of sea-bass and the gilthead sea-bream have been constituents of stocks in the Mediter-ranean vallis (fig. 23.1), Indian bheris and coastal fish farms in Southeast Asian countries. In spite of their predation on other finfish and crustaceans, their market and culinary values made them acceptable species in culture systems. Their stocks in these impoundments were derived from eggs, larvae or fry brought in by the incoming tides. Small-scale efforts in recent years to grow wild and hatchery-reared fry and fingerlings in cages and ponds have shown potential for intensive culture of these species (fig. 23.2). Methods of artificial propagation have been developed and commercial-scale production is becoming established in a number of areas.